Complementing the multipurpose hawkbill blade is an FRN handle design that’s been improved upon for decades. The bidirectional scales are durable and will not warp in extreme situations. A back lock mechanism is easy to use and can withstand nearly anything you throw at it. With thoughtful additions like a finger choil, four-position spoon pocket clip, Boye dent, and jimping, it’s hard to find a better design at a better pricepoint than the Byrd Hawkbill. 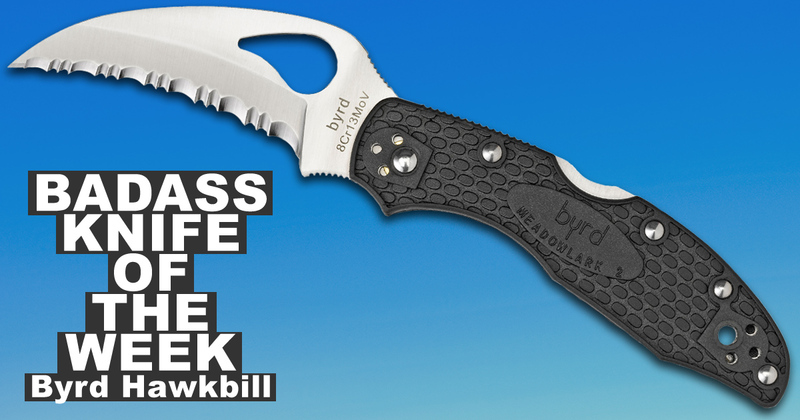 For more info on this Badass Knife of the Week, see the product page for the Byrd Hawkbill.